Sanrio Digital’s Hello Kitty Food Town is a fun little restaurant sim game that features your favorite characters such as the party-lover Kerroppi, the football-loving Pochacco, the devilishly cute Badtz Maru and our darling kitty. The game has lots of unlockable recipes, new and stylish décor to adorn your restaurant and plenty of fun quests to keep players busy for hours. Fans of the Hello Kitty franchise will fall in love with themed furniture, attractive wallpapers, tiles and lots of décor items that can be used to decorate restaurant. The game lets grow and harvest ingredients and make use of cute-looking cooking units to prepare lip-smacking meals for your customers. Just like My Café, this game has plenty of fun combinations for basic and advanced meals. As you attract more customers and make special dishes for them, you will earn more coins and XP. The coins can be used to expand restaurant, buy furniture and new cooking units. XP collected will let you level up that unlocks new units, décor and other fun stuff that can be useful for your Food Town. The game isn’t tough to play and the mini-tutorial will explain basic stuff to get started. This guide offers quick tips and hints to help you earn more coins, complete orders faster and make your restaurant successful. Mentally note down customer orders by tapping tables. The order list will appear as a speech bubble above a table. You can also get a list of pending orders if you have missed an order or forgotten. Just tap the yellow “Orders” desk located on the right side of your restaurant room. Whenever an order is completed, a sticky note appears on top of the desk. The Orders section not only shows pending and completed orders, but also shows what rewards you will be receiving after completing them. Once you have noted down orders from each table, start by preparing primary dishes, such as strawberry bows and creamy milk. These primary dishes can later be combined with foodstuffs to prepare advanced dishes, such as strawberry milkshakes, mochi, fruity fizz etc. All primary dishes will be stored in “Buffet” (pink desk). Next, start making advanced dishes that require a combination of foodstuffs and primary items. Cooking units such as the Desserts Oven, Smoothie Maker, Pies Oven etc., can be used to make advanced dishes. Prepare only those advanced dishes that are being ordered by your customers. To know how what ingredients are required to make them and the quantity, tap a cooking unit and long press on a dish icon. A box will appear above a dish, displaying ingredients and the time required to make the dish. Long pressing a food item will let you ascertain the number of ingredients you currently have in Stash. If there are some foodstuffs missing, quickly harvest them. And if there are some primary ingredients missing, the start preparing them. Make use of extra cooking slots to queue multiple dishes of the same type ordered by your customers. This will ensure that two or more dishes of the same type are being cooked simultaneously, and you will get all dishes at once. Save bows for unlocking extra slots. Farm produce (apples, strawberries, rice etc.) and materials are stored in Stash, whereas all food items prepared by the Hello Kitty gang, such as strawberry bows, fruity fizz etc are stored in the Buffet. Both can store a limited number of items, but you can upgrade them to increase their storage capacity. To do this, you will need materials (I will explain how to get them in the next section). To check what materials are required to upgrade your storage units, tap a Stash or a Buffet and tap the green upgrade button. If all materials have been collected, then their portraits will have a green tick beside them. You just need to tap the blue upgrade button to increase storage space. Upgrade materials are rare to find, but there is a way to get them. All you have to do is deliver takeout orders. The Takeout order feature will be available once you reach player level 6. Just tap the telephone icon, which is at the bottom-right corner of the screen and complete orders to get materials. Takeout order quests range from preparing creamy milk or strawberry milkshake and delivering them to customers who have ordered it via the telephone. You will have to complete all takeout orders to claim your rewards. So if you have prepared only creamy milkshake but haven’t made Mochi and Strawberry milkshake displayed on the takeout order list, then you won’t earn any rewards until you complete all orders shown on the screen. You may have noticed that customers leave your restaurant when tables are full. To accommodate more customers, tap the basket icon at the lower-right corner of the screen and then tap “Table Sets”. Tables and chairs cost coins and if you have just started playing, then your budget should be between 50-100 coins. Start by having 2 additional tables and once you start earning more coins, you can expand your restaurant and place more table sets. You will unlock more sets when you reach a certain player level. Once you start attracting more customers and earn lots of coins, you should consider expanding your restaurant. With expansion, you can add more cooking units and furniture and decorate it with your favorite wall/floor décor. Long press inside your restaurant until the “Expand” speech bubble appears. It will appear on an open space. You won’t be able to expand if there are any obstacles. You can either move certain obstacles, such as storage houses, or remove those using tools, such as the plough. Check Stash to find tools and use them to weed out unwanted obstacles if you are looking to expand your restaurant. As you level up and start earning more coins, new recipes will be unlocked. Customers will demand better dishes that require new ingredients. Expanding your farmland will unlock certain trees and buildings that will provide all required ingredients for new recipes. 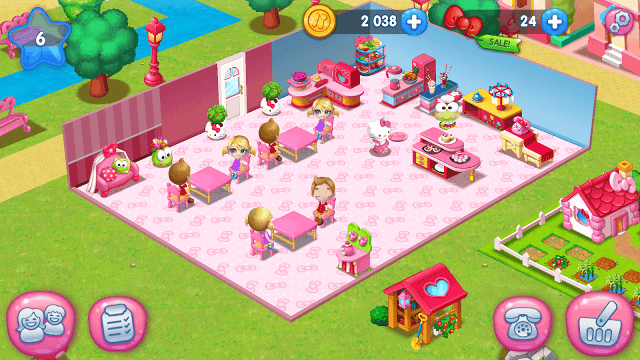 You will have to reach a certain level and have enough coins to unlock a piece of land in Hello Kitty Food Town. For example: To make Fruity Fizz, you will need apples. You must reach level 4 to unlock a piece of land to your left to get the apple tree. Now tap the tree to get apples. Unlocking this land will also unlock the Makery that will let you make Flour, Cocoa powder etc. Bows are premium currency that can be used to speed up food preparation or unlock an extra cooking slot of a unit. There are various ways to get bows. You can login to Facebook to connect with friends and get 20 free bows or watch a video to get one. Don’t waste bows to speed up cooking time. Save them for unlocking an extra cooking slot on ovens. The storage is a shed located near your restaurant. A heart is etched on its roof. Tap it to access storage and then tap your table to select it. It will appear outside the shed. Now drag the table to the desired location.